When kiddo was a baby, this was my favorite of her board books. Keith Baker’s lush jungle scenes combine with a powerful message that applies in equal force to people and other animals. The first half of the book – which is also available in paperback and hardcover – portrays animals scurrying away from a tiger as he makes his way through the tropical forest and is told from their perspectives. The first page, for example, shows birds flying away and reads, “The beast, the beast! We must fly by! 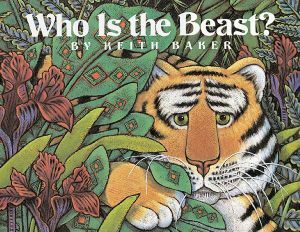 We see his tail swing low and high.” Midway through the book, the perspective changes and the tiger himself asks, “Who is the beast? Who can it be? I see no beast. I just see me.” He then revisits each of the animals who had made a hasty escape and highlights the similarities between them. The catfish also has whiskers; the snake also has green, round eyes; and the bee also has yellow and black stripes. Now that she’s older, kiddo and I have discussed the different meanings in this book: how people are also animals (“beasts”); how the characteristics we share with other people – and animals – far outweigh the ways in which we’re different; why it’s wrong to exclude others; and how we can overcome fear by discovery. But don’t get the wrong idea. While this book has a message, it avoids being heavy-handed – which is why we haven’t read it dozens of times but hundreds. And it’s not just the beautiful illustrations that make this book so darn good. It also has a playfulness that’s sometimes lacking in books that set out to say something meaningful. Pick up a copy from the library and see if you and your kid can find the small snail who hides on each page. We’re still stuck on a couple!